I am drawn into the philosophy of unschooling. 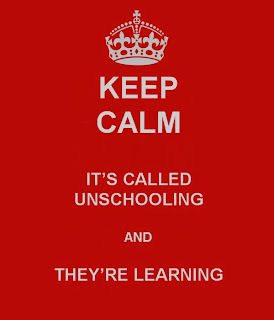 I am fascinated by the belief, the implementation, and the freedom of unschooling. I am determined to raise my boys to think for themselves, think creatively, and follow their bliss. 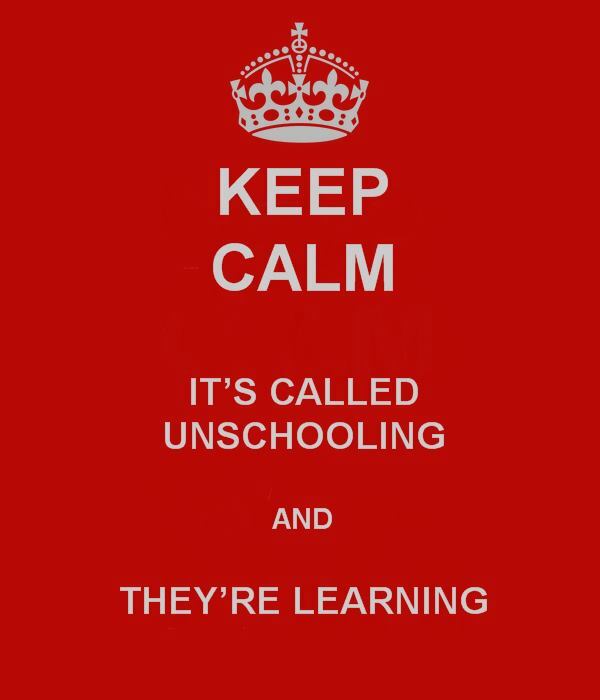 However, as much as I believe in unschooling it's that same old fear that gets me every time.... "HOW do I know that they are learning enough??" It's so scary, but I see great things for us if we can stay the path. I know unschooling doesn't mean I don't do anything, but I'll admit I get sick of planning activities, picking books and things to do only to be met with shrugs or answers already formed before we've even started. I love that my boys are smart, but I'm sick of feeling like I'm re- teaching them things they already know (and letting things they don't know slip through the cracks because I think they do know it or might not be interested in it). To KEEP reading blog after blog, book after book, and article after article to keep me motivated and on this path of unschooling. To keep searching Pinterest for ideas and make suggestions to see if anyone is interested in doing those things that I found and thought looked interesting. Meeting with the kids individually once a month (or once every few weeks) and brainstorm activity ideas, book ideas, learning and curriculum ideas to help them focus. I didn't do this the last few times and I think they faltered in not knowing what to do all day. The choices set before them were overwhelming, but they did love learning through play and I think over time we could be great unschoolers. To give myself grace and realize that teaching a lesson here or there or asking the boys to do traditional schoolwork in a subject or two does not mean that we have failed completely. To remember that our unschooling home may not look like any other unschooling home but that's OK. We have the freedom to choose what works for us. 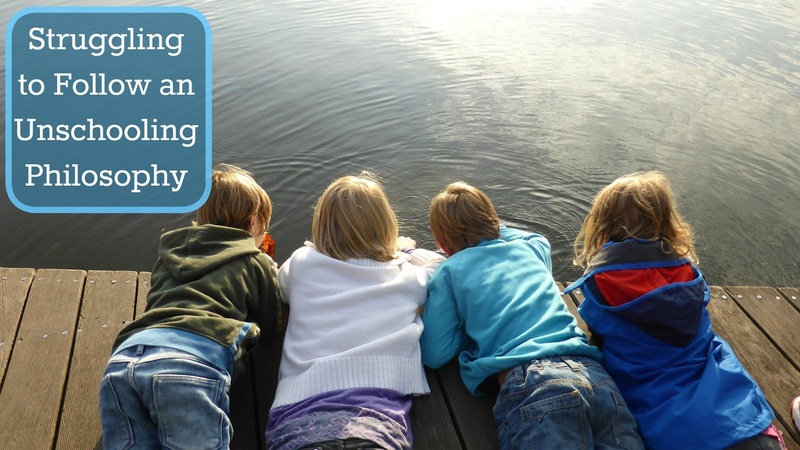 I know it's not easy to embrace a whole new philosophy and way to life overnight and that's essentially what unschooling is... a whole new way of life. It's hard to de- program myself and look at learning in such a different way. Delight led learning does scare me a bit because I always think that there are things they aren't going to want to learn about that I truly want them to know. It's hard to see in the short term the long term outcome and it's easy to focus on the here and now and panic. I can't fail at this because then I fail my kids. No one wants to fail their kids. But I believe they will grow, learn and thrive mainly because I do care so much and because they will be having to much fun not to thrive. They'll end up learning in spite of themselves I'm sure. But, wow!, is it hard to let go of those "they should know this by now" thoughts. I love those times when we focus on play and the importance of play. I love when we play games with abandon, followed our bliss, and, quite frankly, even allow screens. We always love field trips and while we have taken a hiatus for the summer we're all anxious to get back to them (though this is due to hot days, high crowds and just summer business not any sort of homeschooling philosophy). And yet as I look back on our last two days I see that even without my involvement my boys incorporated math, reading, writing, geography, and vocabulary into their day as well as many gross and fine motor activities. It's hard to teach myself to see what they are learning and not think about what they aren't. It's hard to remember I want to focus on the process, not the product. I want to build self- motivated learners that can lead and teach themselves.